This homemade vegetarian minestrone soup is vegetarian comfort food at it's best! Recipe yields 2 quarts of soup and yields 8 cups or 4 larger bowls of soup. Heat 1-2 tablespoons of your favorite olive oil over medium heat in a large pot. Add the onions, carrots, celery, butternut squash and bell pepper, and cook on medium, stirring occasionally, until the vegetables soften, approx 10 minutes. Add the garlic towards the end to prevent burning. Next add your tomato sauce and 5 cups of vegetable broth (save the other cup to add later if desired]) along with your bay leaf, garlic powder, basil, and oregano. Save the salt for the end and season to taste. Bring to a boil, then lower the heat and simmer uncovered for 30 minutes, until the vegetables are tender. While your soup simmers, bring a pot of water to boil and cook your pasta if you . Some recipes swear by adding the raw noodles to the soup towards the end to add to the thickness of the soup but I always find the result to be a bit slimy and the noodles soak up a ridiculous amount of the broth. For best taste and results, I cook my noodles separately. 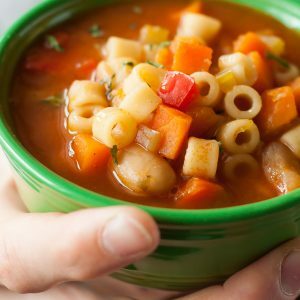 It's an extra step [and pot] but 100% worth it to me for the difference it makes with soups like minestrone that are a perfect combination of brothy and chunky! Add the beans and cooked pasta and heat through. If the soup is too thick, add an extra cup of vegetable broth. Depending on the saltiness of your beans, tomato sauce, and broth, you'll want to salt the soup based on personal preference. That may mean no salt at all, just a pinch, or 1/2 tsp like I used. Let your tastebuds be your guide! Serve with slices of crusty baguette spread with your favorite butter. Feeling fancy? Whip softened butter with your favorite pesto and serve with a crusty french baguette dunked in the soup sandwich-style - YUM! Nutrition facts below are an estimate provided by an online nutrition calculator and do not include extra additions or swaps.